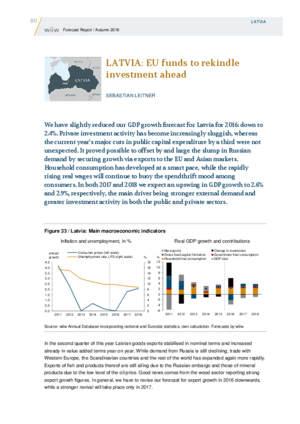 We have slightly reduced our GDP growth forecast for Latvia for 2016: down to 2.4%. Private investment activity has become increasingly sluggish, whereas the current year’s major cuts in public capital expenditure by a third were not unexpected. It proved possible to offset by and large the slump in Russian demand by securing growth via exports to the EU and Asian markets. Household consumption has developed at a smart pace, while the rapidly rising real wages will continue to buoy the spendthrift mood among consumers. In both 2017 and 2018 we expect an upswing in GDP growth to 2.6% and 2.9%, respectively, the main driver being stronger external demand and greater investment activity in both the public and private sectors.